Tasting Notes: Initial mineral taste, followed by sweet, floral notes then finishes wonderfully with a slightly astringent, mouth watering aftertaste. Easily the most famous wulong tea in China. We know by the name, “Da Hong Pao,” that it is the product of three hundred years of innovation, studious agriculture, and fantastical lore. Modern Da Hong Pao is a tea maker’s blend of leaves from bushes local to Wuyi Mountain, where wulong tea was first invented in the 16th century. 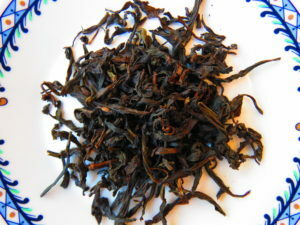 The name “Da Hong Pao” (or “Big Red Robe” in English) is alleged to have come from a few different stories; some stories that say its tea bushes were so revered that they were cloaked in red robes by imperial officials, while others simply claim the name was a poetic description for the color of local tea bushes when dusk light is cast through their newly grown leaves. Whatever the case, for at least the last century, the characters “Da Hong Pao” have been carved in a rock beside a cliff perched garden on Wuyi Mountain. The few bushes in this tiny garden are the ancestral material for the modern Big Red Robe.